MLS students providing innovative solutions to complex legal issues. They have designed and built a range of legal help websites to provide the public with fast, accurate and cost-effective information about common legal problems including inaccurate credit reports, handling and managing fines, and assessing employment rights. The students compete for the right to have their ideas developed in the annual presentation called The Bake-off. While the competition can be valuable in generating new ideas, the real learning comes from students better understanding the interface between law and technology. MLS is the only university offering practical work in technology and the law. The legal expertise websites are designed to replicate the thought processes and actions of a lawyer and provide tailored legal information to non-lawyers and the not-for-profit sector as part of the Melbourne Law School’s Juris Doctor Degree. 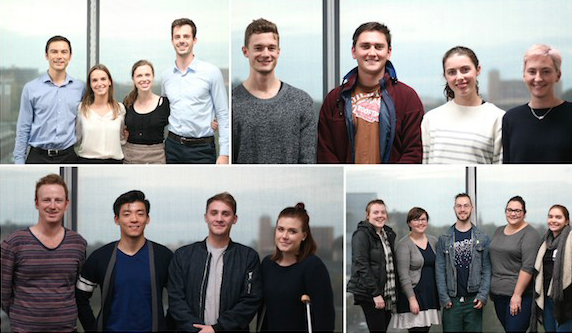 Students will compete for the title of ‘The Slater and Gordon Award for Law Apps’ before a panel of judges, where their projects will be assessed on their usefulness, completeness, ambition and creativity, design and presentation. One of the sites from last year, designed to assist not-for-profits, is now live and will be demonstrated at the annual event. Melbourne Law School Dean Carolyn Evans said new technologies were providing innovative solutions in the law. “The MLS is the leader in Australia in regards to technology in legal education. Melbourne is claiming the space of technology in legal education,” Professor Evans said. Subject teacher Gary Cazalet said the subject offered at MLS received support from Georgetown University, law firm Slater and Gordon and technology platform Neota Logic – a platform providing non-programmers with the tools to efficiently build, test, maintain, and deploy expert applications. "During the development of their websites, students receive substantial and ongoing advice from Neota Logic’s experts both in Australia and the US, enabling students to create applications of the highest quality," Mr Cazalet said. “This results in the creation of fast, accurate and cost-effective answers to common legal problems." Slater and Gordon Victorian General Manager of Personal Injury Dina Tutungi, who is one of the judges for the event, said it was important to encourage and support the next generation of lawyers to become innovators. Neota Logic is a global provider of intelligent software for the legal and compliance industries. Combining rules, reasoning, decision management and document automation, the company’s easy-to-develop smart applications enable business solutions that deliver process improvements, reduce risk and ensure compliance. Neota Logic applications are mobile-ready, can be embedded within portals and websites and integrate easily with other systems.